Country Divine Anti-Oxidant All Natural Moisturizer Facial Cream With Emu Oil 2 oz. Jar. Our natural age-fighting Anti-Oxidant Moisturizer Cream renews skin's appearance using natural moisturizers, the regenerative properties of pure Emu Oil, and natural sources of vitamins. This unique combination of ingredients results in skin that looks and feels more like new skin, reducing the appearance of wrinkles. Most moisturizers work only on the top-most layers of skin, called the corneal stratum. Using the penetrating properties of pure Emu Oil, Country Divine Anti-Oxidant Moisturizer Cream penetrates deep into the sub-dermal layers of skin to protect, renew, and moisturize skin at all layers of the dermis. In addition, many moisturizers contain artificial colors and harsh preservatives, which serve to take more from our skin and, ultimately, have the opposite of the desired effect. 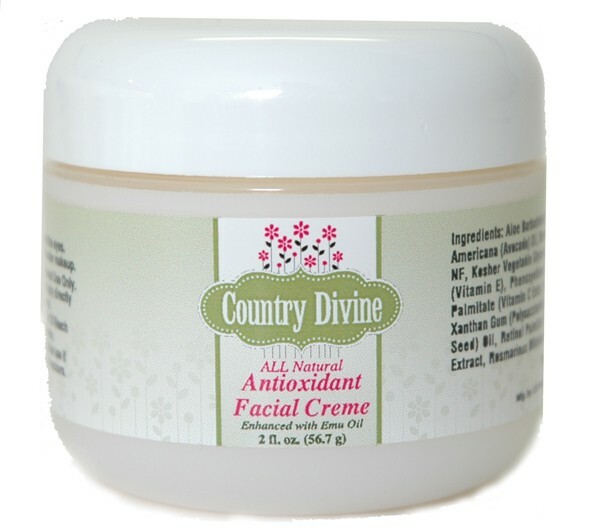 Country Divine Anti-Oxidant Moisturizer Cream contains only all natural ingredients. Acts as a barrier between your skin and the environment. A tree-like form of the aloe vera plant used for it's skin nourishing and anti-irritant properties. This by-product of soap is a humidifying agent and skin moisturizer that absorbs moisture from the air. It also improves the creaminess of the product. An organic chemical compound which serves as a biological buffer and bacteriacide. This natural oil is extracted from the desert shrub Simondsia Chinensis. It is vital in helping to restore skin's natural lipid barrier, creating soft and supple skin. Also known as Retinyl Palmitate, this anti-oxidant is known for its anti-aging benefits that help firm and smooth skin's texture. The moisturizing effects also help to prevent dry skin while keeping skin healthy and clear. Also called niacin and nicotinic acid, this water-soluble ingredient has been shown to prevent skin from losing water content, as well as stimulate circulation in the skin. Recent studies have shown that it also improves the appearance of wrinkles, skin discolorations, reduces redness and improves skin elasticity. Vitamin E is known for its anti-oxidant and moisturizing properties. It is also thought to protect against the effects of environmental pollutants. This important vitamin found in citrus fruits, tomatoes and green, leafy vegetables is an important anti-oxidant that also offers clarifying benefits.